Stitching for Christmas? - Join ELF DAY. One of the pleasures of embriodery is bouncing ideas off others and sharing techniques with like minded people. Embriodery is always a good excuse for a get together, a cup of tea and a chat. 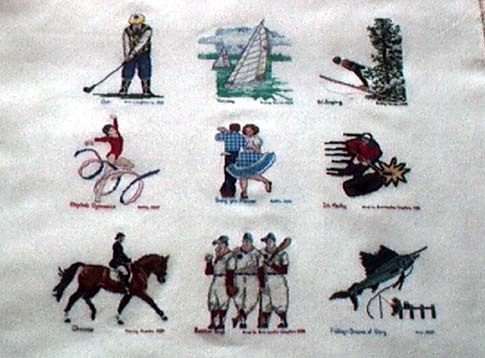 This page shows some of the work stiched by friends. The pieces below will make up a wall hanging in memory of Hilary who was part of our Thursday stitching group and sadly past away last year. The Hanging will be made up of seven panels stitched by different members of the group. The finished wall hanging will go to Hillary's church in Whitstable Kent, UK. My own piece is the Bird of Paradise, at the end. 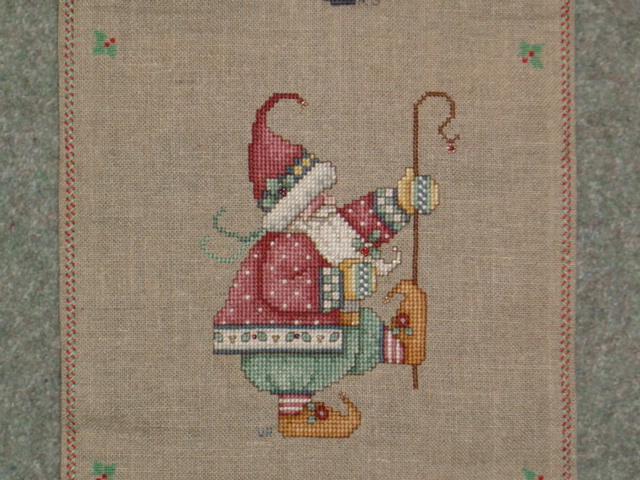 The Father Christmas's on the right are part of a bell-pull and were stitched by various internet stitching contacts in America and Canada in a round-robin. Likewise the sport theme round-robin. I did the sailing boat. Unfortunately I haven't got a better photograph of that one. 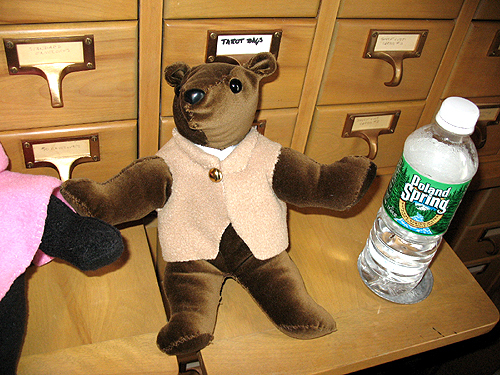 The cats in the right panel are another Round Robin also stitched with friends who I meet on the American Craft Forum. It's stiched on 28 count even weave fabric in cross stitch using one thread over one thread of the fabric (one over one). The insects below were worked by two friends, Kathy and Helen, at an embroiderers workshop learning new techniques in Goldwork. 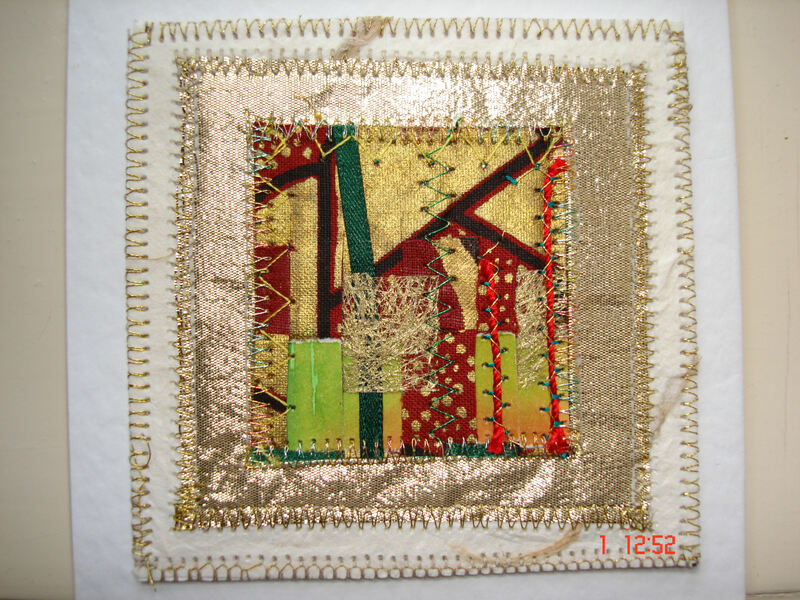 The embroidery on the left below is one of Helen's experimental pieces incorporating special materials, which when heated produce interesting textures that she has enhanced with her own unique style of stitching. 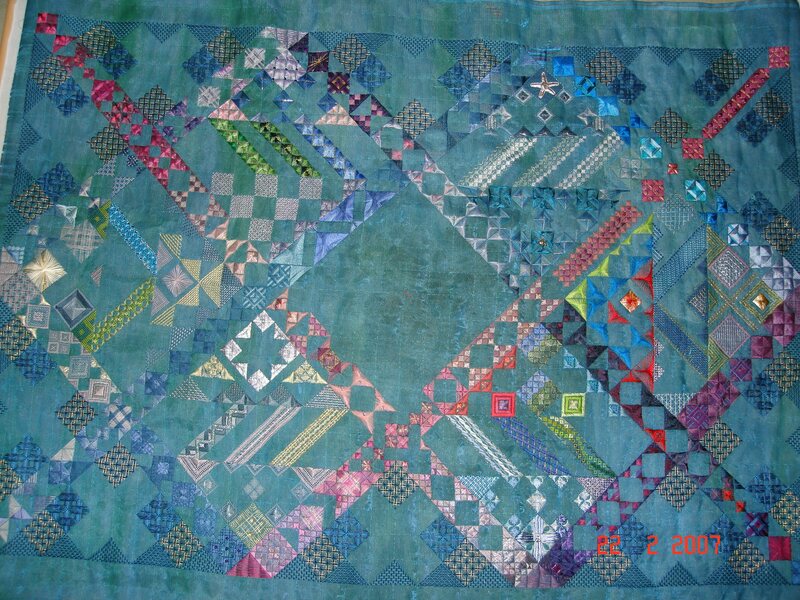 The piano hanging that I'm working on, now called the boring sermon quilt, will be hung over the back of a piano in a Methodist Church, when its finished. It's called the boring sermon quilt because it gives the congregation something to look at if the sermon is boring. If you want to see individual stitches and you have a fast connection, click here. 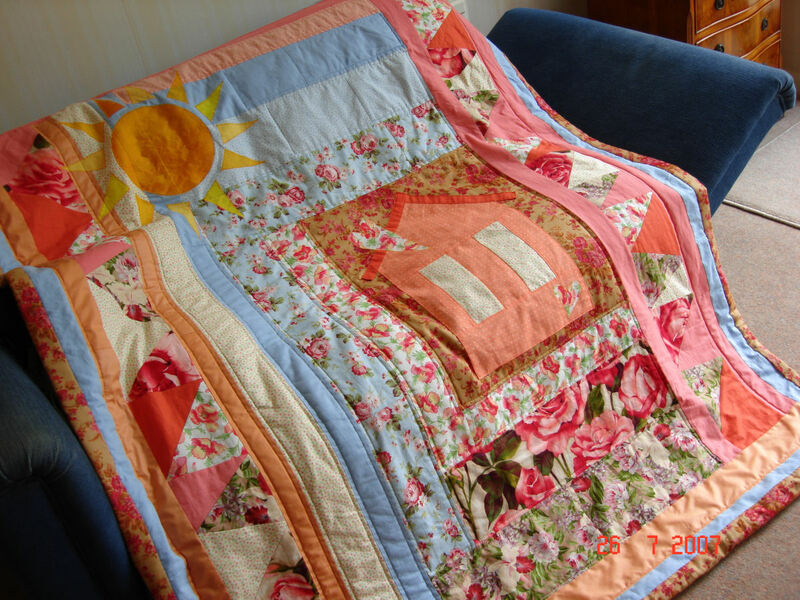 Below are some pictures of quilts being worked on in our Thursday group. 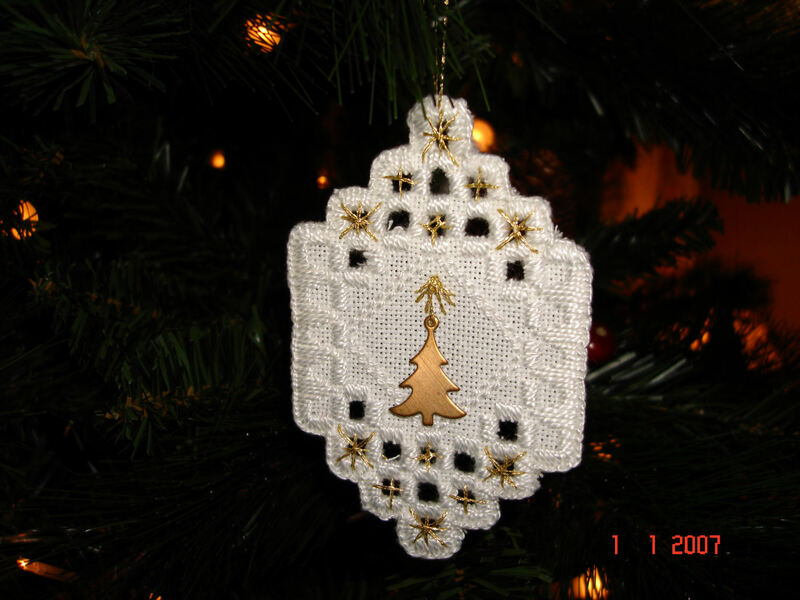 At Christmas time members of the Crafts Forum send a Christmas Tree decoration to the organisor of the Christmas Ornaments Swap. 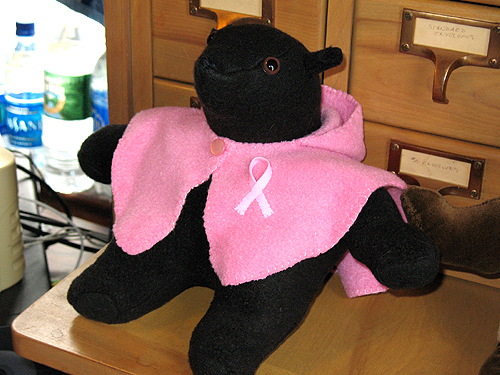 She sends a different decoration to all the members who participate. The Christmas Tree decorations in the right panel are ones that I have received over the years. The pictures below and in the right panel, where taken at the Suzhou Embroidery Research Instute in China. These photos were taken in a workshop. The girls work on large frames, using dyed silk thread on silk fabric. In one of the photos the girl’s arm and hand are clearly visible through the fine silk. The girls work from a picture and copy it straight onto the silk. This can clearly be seen in the work of the steps of the bridge. Threads are hung on rods in colours and are chosen by the girls by eye, laying a thread on the work to test the colours. This is shown in one of the photos. For the Cranes and flowers Satin stitch is used. 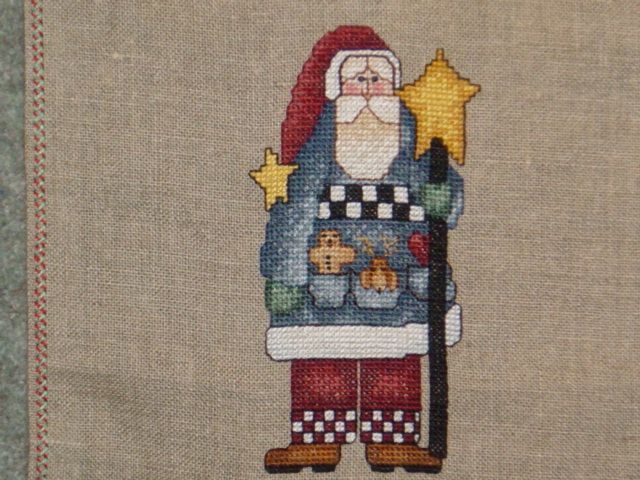 For more textured areas and background, a cross stitch is used. 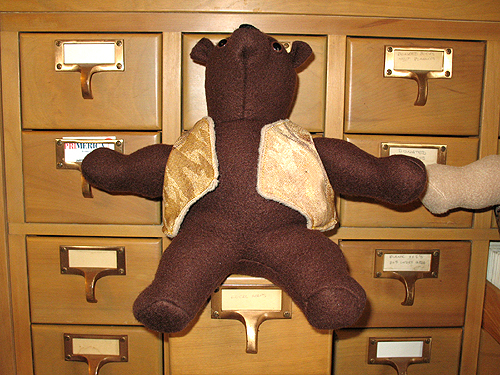 This is stitched longer or wider to suit the position. 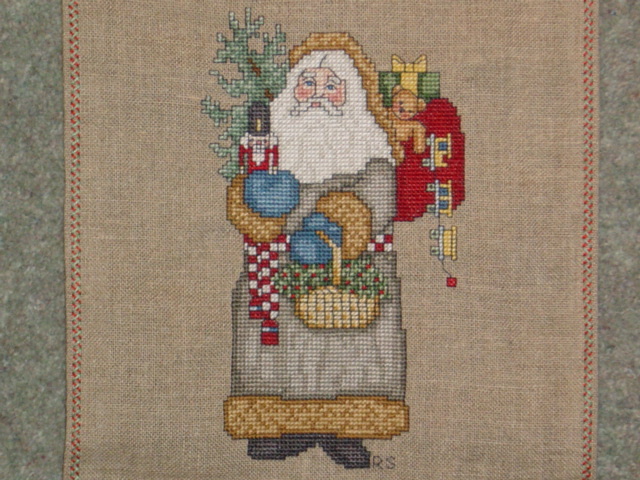 Long straight stitches are used for the background where a suggestion of colour is required, rather than a dense covering. Many of the pictures are able to be seen from both sides, and it is impossible to tell which is the front or back of the work. 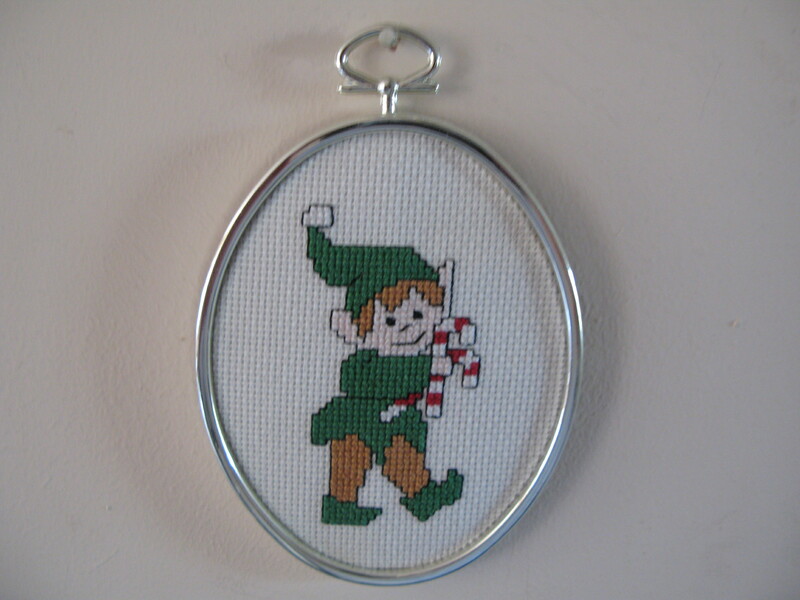 When joining a thread a small back stitch is used and the end is stitched over and cut off. The same technique is used to finish a thread. Some of the pictures have different colours on each side of the work. 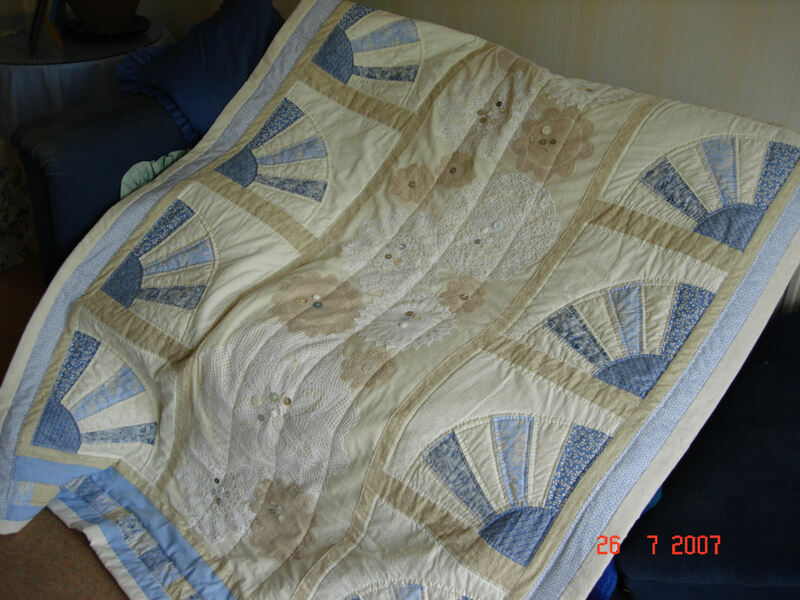 This is achieved by using two colours that are crossed through the fabric, leaving a colour on each side. There are two photos of a girl knotting a very fine silk carpet in the panel. You WILL need a fast internet connection to enlarge these photos. I kept the original size so you can zoom in to see more detail. 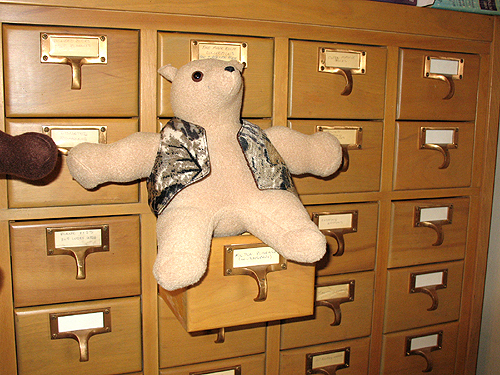 The Hippo, below, was part of a "Tatt it and See" as a bit of fun, organised by Jane Eborall from the Ring of Tatters . 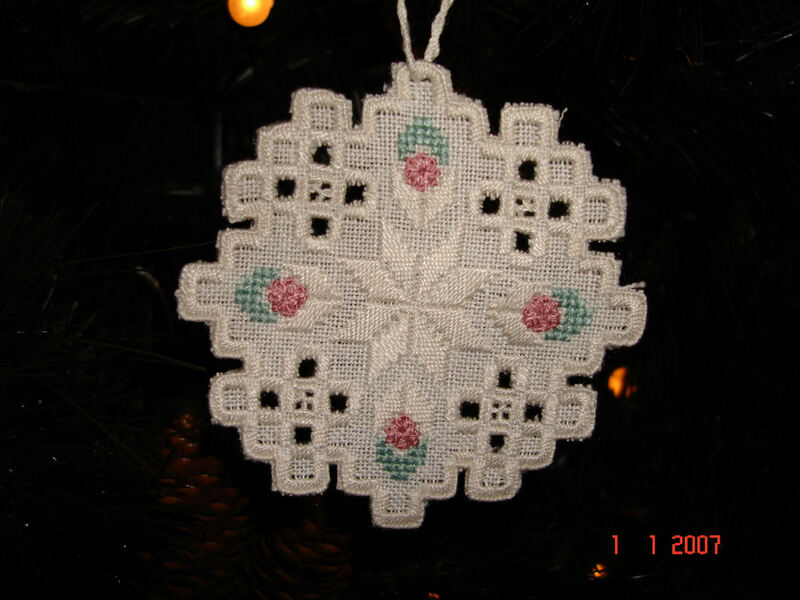 Every few days Jane put the next piece of the pattern on her blog without telling us what the finished item would be. 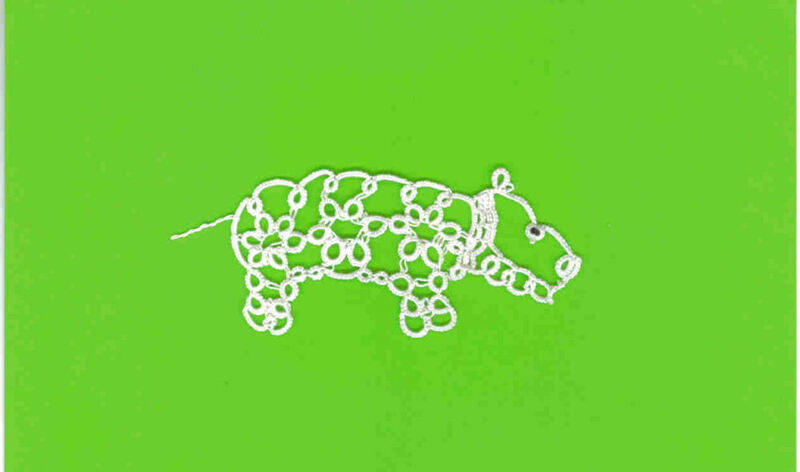 Many other finished hippos can be see on Jane's site TatitAndSee .